It doesn’t get much more all-American than this. Chris Fogt, 34, is an Eagle Scout. He’s a three-time Olympian in bobsled. And he’s a major in the U.S. Army who spent a year deployed in Iraq. Fogt earned Eagle on March 16, 2000, as a member of Varsity Team 851 of Highland, Utah, part of the Utah National Parks Council. But he doesn’t see Scouting as something from his past. It’s part of his present and future, too. That’s why, somehow, Fogt makes time to be an adult volunteer. While stationed at Fort Hood, Fogt has served as an assistant Scoutmaster with Troop 239 of the Longhorn Council. He has two children who are still too young to be in Scouts, but he volunteers his time because he wants “a chance to shape kids’ lives at that crucial age,” he says. 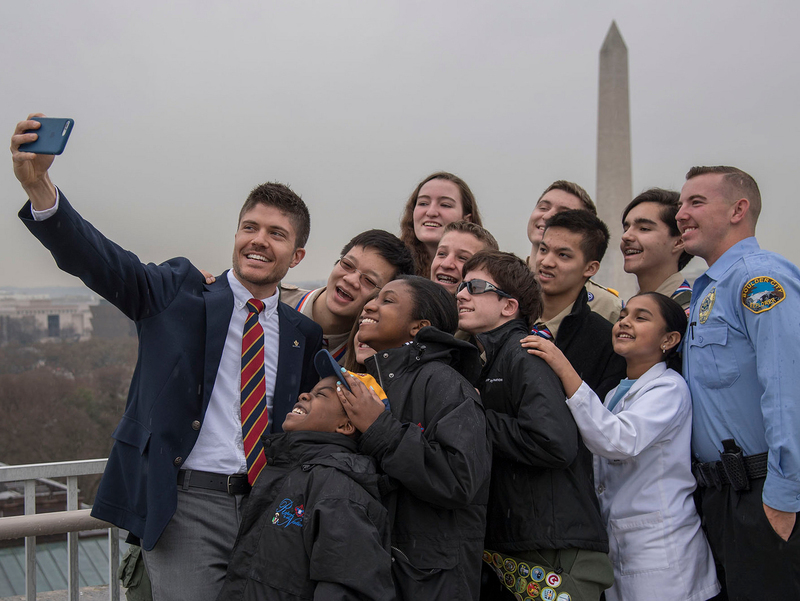 Fogt, who has witnessed the proliferation of smartphones and Snapchat, says Scouting offers a chance to unplug. Fogt is one of eight children — five boys and three girls. In a crowded household, Scouting gave him a chance to become his own man. The BSA provided “quality time away to just be able to talk and hang out and get some more one-on-one time,” he says. Fogt has a speech impediment. He stutters occasionally today, but it was more pronounced when he was a kid. Some of his schoolmates made fun of this stutter — a fact that made Scouting even more of a respite. For his Eagle Scout service project, Fogt made a detailed map of a cemetery in Alpine, Utah. Before the project, visitors spent time searching the cemetery for their loved ones’ graves. Now they can find those markers right away. Like all Eagle projects, this one improved the community. But when Fogt told his friends about it, some eyebrows were raised. “You have this 15-year-old kid, and your friends say, ‘what are you guys doing?’ ‘Well, we’re in a graveyard for three hours,'” he says. Steve Holcomb (left) and Chris Fogt (right), receiving their bronze medals in 2014. The other: Steven Holcomb, who died in his sleep in May 2017. “At the Games, he’ll be on our minds,” Fogt says. Team USA’s bobsled team will wear the initials “S.H.” on their uniforms to honor their fallen teammate. Holcomb liked to wear a Superman shirt under his speedsuit, so Fogt will do the same. Fogt says he and Holcomb frequently talked about their time as Boy Scouts in Utah. They had another thing in common: both were late bloomers. As kids they were smaller in frame than their peers. Fogt, a major in the U.S. Army, thought he was done bobsledding after the 2014 Games. But when he learned he would not be deployed to Kuwait, he decided to try to make his third Olympic team. In Pyeongchang, he’ll be one of three push athletes for the four-man sled driven by Justin Olsen. They’ll try to give the sled its fastest possible start. That power pushed Fogt to bronze in 2014. Not bad for a “shy kid with a speech impediment” from a small town in Utah. Fogt says Scouting helped him gain confidence, and he sees a lesson there for his fellow Scouts. Competition dates: Two runs on Saturday, Feb. 24, and two on Sunday, Feb. 25. The four times are added up, and the fastest total time determines the winner.